Just saying the name of this recipe is fun and elevates it to a more exotic level. I tested this recipe and made this meal for my son a few months ago, planning to serve it to my sister-in-law and her friend when they visited from Brazil in September. The bummer was that I never actually had the chance to make it when my Brazilian guests were here. We did eat well, and I did get to cook for them, but brunch was never in the plans, so my Banana Rabanada had to go by the wayside. This recipe is another total winner from Isa Chandra's "Vegan Brunch" cookbook. Basically you soak good bread in a super delish banana milk, toast them in a hot skillet, and serve them with cocoa and cinnamon. Simple ingredients, fantastic result. The bread is key here - choose a high quality baguette and toast it completely to create those chewy places. I think I might have gone overboard with the cocoa powder, but it was worth it. I think this would be a good choice for a brunch party, because it could hold well in a warm oven - it's pretty sturdy. Blend the bananas, milk, cornstarch, and vanilla in a blender. Place bread slices on a baking sheet and pour the banana mixture over them. Allow the bread to soak for about 20 minutes, turning them over at the 10 minute mark. Heat a skillet, use a small amount of oil, toast the bread slices for at least 5-7 minutes on each side. Do not try to turn them over too soon! Let them get brown before you flip them. You don't want any of the banana goodness to 'peel' away from the bread and get stuck in the pan. Mix the cocoa powder and cinnamon together and dust each serving liberally before serving. Yesterday I shared appetizers, soups, and salads. Today I share vegetable side dishes, main courses, and desserts. 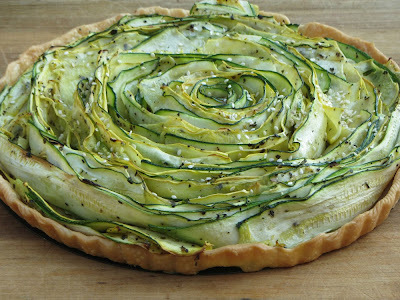 Zucchini Tart - much easier than it looks! Vegetable Bake with Crispy Topping - I only made this once, but I still remember it. It's on my menu for this year's Thanksgiving. Some menu ideas for your upcoming day of thanks. I chose recipes that can be made ahead which makes the big day of eating and watching football and being with family and friends a little more relaxing. You can find recipes by clicking on the links. This will be the 4th year that I have not served or eaten the traditional turkey dinner on Thanksgiving, and guess what? I'm still alive to tell about it! I didn't shrivel up and waste away because I didn't eat turkey on Thanksgiving. Can you rise to the challenge and step out of the the box a tiny bit? Try some new foods and see how much your guests appreciate it. Today I'm sharing appetizers, soups, and salads. Tomorrow I'll share vegetable side dishes, main entrees, and desserts galore. Burgundy Mushrooms- serve with good bread to soak up the juice - it's amazing! Cauliflower and Potato Soup with Applesauce Reduction - this is a restaurant photo, mine is much different, but my version of the soup was memorable! Creamy Wild Mushroom Soup - a meal in itself, but perfect as a first course on a Thanksgiving table. Celery Salad with Miso Dijon Dressing - I always associate celery with Thanksgiving. Dijon, Orange and Dill Dressing - good on greens or veg. What glorious fall colors! This soup is a total winner. I used a combination of recipes from all over the place to create this warm, spicy, comforting (and gourmet, if I do say so myself) bowl. If you are fortunate enough to use fresh carrots, do not throw away those carrot tops! The garnish is a MUST in this soup. I'm still all a-glow over the carrots I grew in my garden this summer and I'm already planning to expand my space for even more next year. Aren't they gorgeous? Basically, you soften the veg in coconut oil, simmer it all in veg broth, and then season well with coconut milk, curry and ginger. Heat the coconut oil and add the onions. Cook on medium until onions are soft. Add the remaining ingredients and simmer until everything is well cooked. I often allow my soup to sit around with the lid on to really help meld the flavors. It's good to let it cool a little bit before blending it anyway. I made a double batch.... plenty for the freezer. Keep blending it until you get a nice smooth consistency. The amounts given is enough for the double batch of soup I made..... You might want to reduce quantities if you're only making a single batch of soup. OR - keep the pesto in the freezer for other uses. I didn't waste any! I even used a tiny bit in some 'ranch' dressing the next day - AMAZING! Not a lot to say about these, except that they are tasty little buggers. What is it about eating food with your fingers? Appetizers and small plates are so fun to serve and eat. I served these corn fritters with marinated mushrooms and a Spanish 'Queso' Fundido and garlic toast. Thinking back on the meal, I remember that the corn fritters could have benefited from some spicy mayo, or a drizzle or dollop or drip of some concoction. Something to keep in mind. 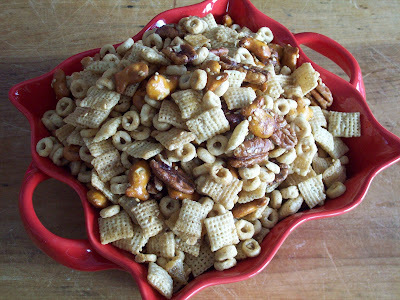 Mix it all together until it's a thick, sticky mess. Form small patties. Fry until brown. Looking for something spectacular to serve on Thanksgiving? Want a contrast to the pumpkin pie on the dessert table? Tired of all the cheese in your diet, but still want to indulge in something rich and decadent? This recipe is from the fantastic site "One Green Planet." Their recipes are always spot-on and this is no exception. True, strawberries in November is a tiny stretch, but I bet at Thanksgiving you'll find them. I'm betting that other fruit would work well in this cheesecake as well: mango, raspberry, blueberry. I remember the first time I used Medjool dates in my baking.... I was skeptical. Now, it feels like the most natural thing in the world. So if you're new to 'raw' baking - fear NOT! It's simple and super tasty - better than using butter and eggs. Blend flour and walnuts in food processor. Add dates, vanilla and salt and continue to blend until well incorporated. Press into a 9-inch spring form pan. Combine the filling ingredients in a blender except for the coconut oil. Melt the coconut oil and add it to the blender. Pour the filling over the crust and freeze for at least 2 hours. Blend the strawberries, dates and lemon juice till smooth. Pour over the top of the cheesecake when ready to serve. Garnish with more strawberries.